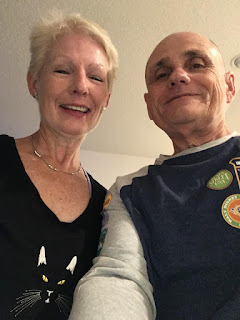 Welcome to 2019 and the start of my Blog Hopping Year. When Carla over at createinthesticks put out the notice that she was putting together a Black & White Blog Hop I was thrilled. I happen to have a huge stash of Blacks, Whites and Grays. I didn't have a real plan at the time but knew I would have no problems putting something together after the holidays passed. And then came this little beauty. It is my first ever embroidery machine, it's the Baby Lock Solaris which hit the market in September. I knew nothing about machine embroidery when I brought her home, as I've mentioned in my previous post, the gal in the quilt shop told me to go home and play and not be afraid. A day in I decided to use the Black & White hop as a great goal for this adventures kick off. So I set up my machine with a chunk of white fabric and a chunk of black fabric and a bunch of black and white thread and the games began. This is the very first piece I ran. 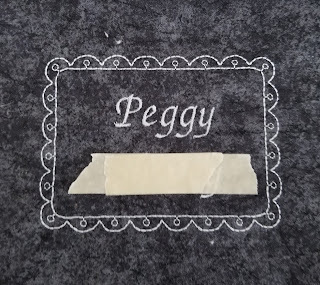 It is my sister's name in a border. Don't know what she'll what me to do with it but she's coming to town this week and I'm sure she'll have a plan. Then I wanted to make her a zipper pouch with her initials surrounded by a niffty quilt pattern. Well this is the first attempt. Attempt #2 went much better, not exactly what I wanted but until I take a lesson I will consider it a success as it made a great pouch. Sissie is the one who talked me into the machine so she will get the bulk of the test items whether she wants them or not. Then I saw embroidery on ribbon and thought I'd give it a try, why not. The ribbon is white, the lighting left a bit to be desired. Then while spending hours on Pinterest and YouTube I came across FSL ( free standing lace). I love these pieces. I love them so much I want to share them with one of you who takes the time to comment on this post. And now one more item for this hop. I have a friend who has "volunteered" to take samples of my test items and give them a home. Actually she and her hubby each got samples as part of their Christmas gifts this year ( see previous post) Anyway this week I decided I would try my hand at a tee shirt. I had tried out this sweet cat pattern with no specific plan and since it turned out well and I still had time to add it to this post I decided to do it on a black tee and add it in. with a body. I have a lot to learn but feel I'm off to a good start. 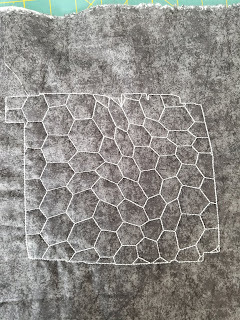 Yesterday I took a class on edge to edge quilting on an embroidery machine based on the book by Amelie Scott. I see some potential there that I'm sure will show itself in an upcoming hop or two. Next week I start my official classes on using the machine to learn 16 different embroidery techniques, looking forward to it. 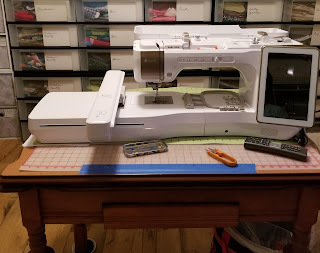 So to make sure I stay interested in my machine and not that it turns into another expensive passing fad in my life I have decided to use it for some part of every blog hop I participate in this year. That would be 12+. So if any of you have any incite or ideas or any thing that you think would benefit an embroidery newbie I'd be happy to hear about it. So now I want to list all of the participants in this hop. Those before me in case you missed them and those following so you don't miss them. Wonderful Black and White ideas at every stop. I also want to thank Carla for taking on another one. We all so appreciate the effort and the ongoing camaraderie thats been happening for so long. So I will pull a name from the list of comments on Sunday night for someone to receive 4 FSL (free standing lace) pieces. Thanks for stopping by. I love the fact that you are using and playing with your machine - no fear! I gift out my samples and test pieces as well - let someone else enjoy a quick finish. I never thought of doing my own tape labels, so thank you. Now the cat shirt if just 'meow' and nice to see you as well. 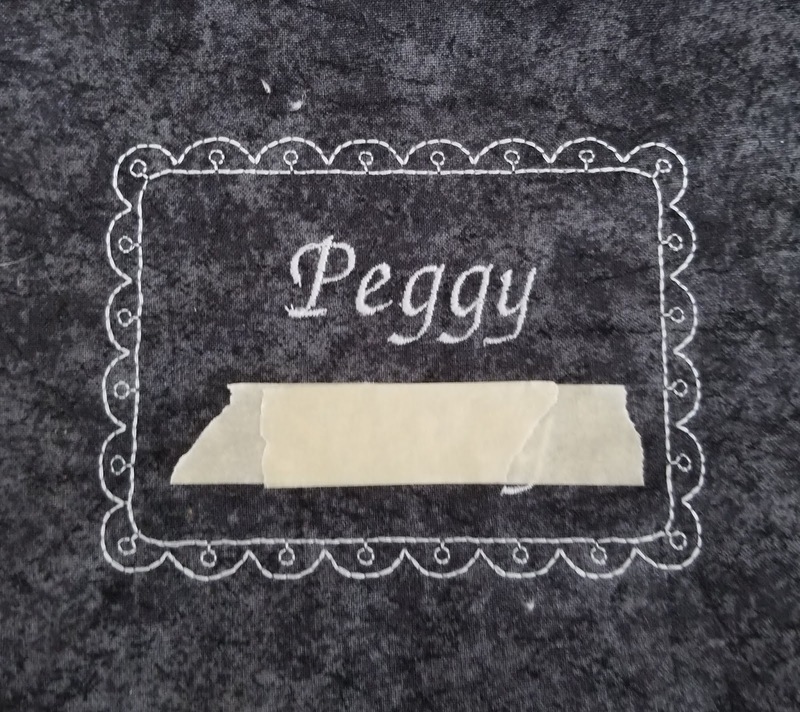 You've already found many great uses for your embroidery machine! And I think it's a great idea to give the samples out to other people and see what they make of them. My MIL has an embroidery machine and I think she would love the free standing lace things. I will definitely be telling her about that so she will be inspired. Thanks for sharing! You are doing really good on the new machine. 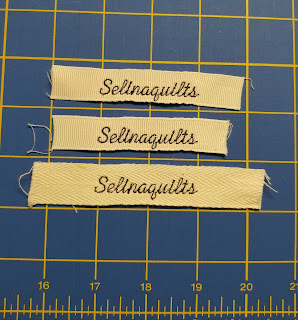 Your test samples look really nice, have lots of fun with your new embroidery machine! I share your enthusiasm for your new toy. Seems your having so much fun with your new embroidery machine. I have one and made many things. I’ve made 2 baby quilts by embroidering animals on 10 inch blocks then turned it into a quilt . I need to make another for a new grandbaby on the way. Oh, look at all the fun you are having. Look out world after you have a couple of real lessons, eh? 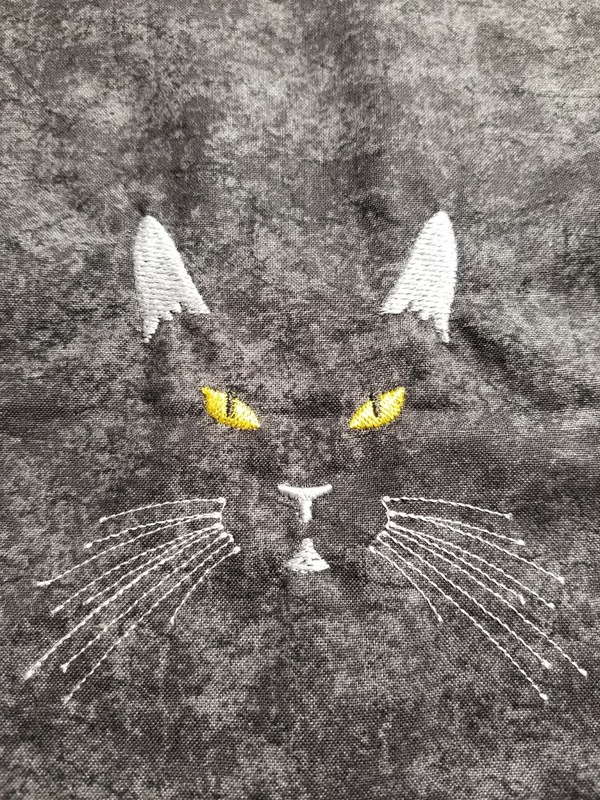 A great pouch and such a cute cat face shirt. Enjoy! Oh, that is so cool. I think your creative juices are just beginning with that machine. What a fun time this year will be, watching as you learn. Thank you so much for joining the Black and White Blog Hop. I'm excited to see some machine embroidery. So much fun! 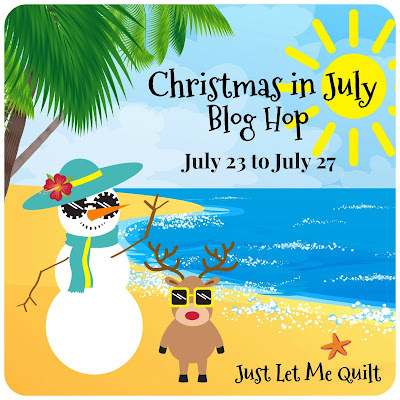 I like your intention to use during every blog hop. 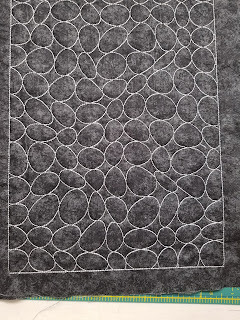 When I got a new fancy one for quilting, I took a challenging class that really got me going. I think your approach will work just as well. It's inspiring to see what you've made with your new machine. I'm going to have to drag out mine more often. I used it one time to quilt individual blocks on a quilt, but I love that quilting you did for the zipper pouch. Great idea! You are off to a great start! 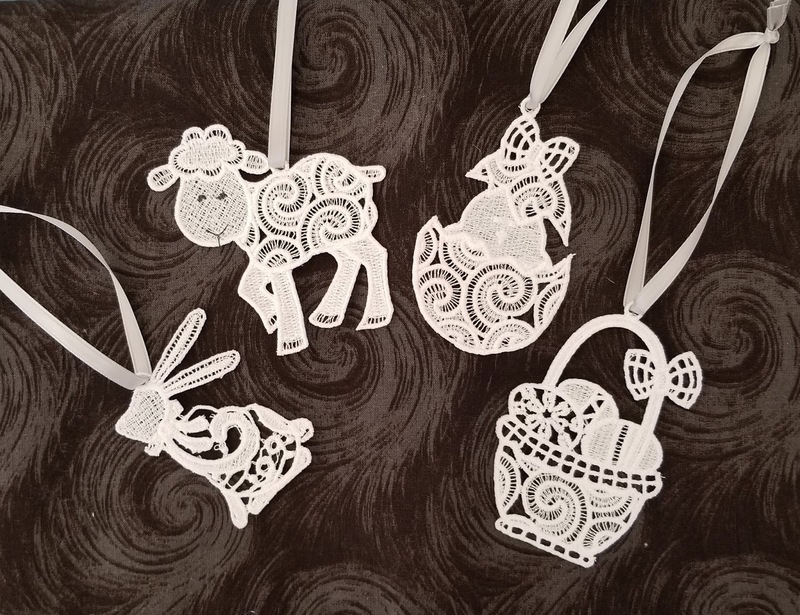 Those are such fun projects - especially the free standing lace. Have fun. How cool! I got an embroidery machine a few years ago and told myself I had to try everything, even if some didn't turn out. How great that you have someone to give the sample pieces. Those free standing lace pieces are lovely. I am just starting to try this technique. Thanks for the chance to give them a home. 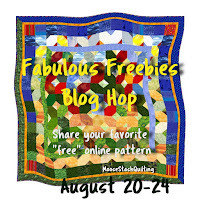 Adorable embroidery pieces & no embroidery help here as I do mostly Patchwork type quilts. Congratulations on your new machine. You are off to a great start with it. If you are this good now, imagine how good you will be after lessons and more practice. Thanks for the chance to win. NICE...I haven't embroidered in a very long time, but those little lace guys sure make me want to fire up my machine again. Your kitty shirt is just too cute and it's nice to see you in the photos. My only advise on machine embroidery is have patience. The learning process almost made me want to throw my machine out the window a time or two! LOL! Wow! You started out with the big dog! I know you will enjoy it. If you're on FB, you need to follow Missy Billingsley. She works for Babylock, and she has a group where she teaches all kinds of things. She just got her own Solaris. It's wonderful that you're making the commitment to use your machine - I love your kitty! The Blog Hop was a GREAT reason to test out your new embroidery machine. I claim it a HUGE success!! Really? Like three tests in and you are making free standing lace? That is awesome. You are a quick study. And I love the kitty tshirt. It turned out great. Thanks for sharing your adventure with us. I love your projects and the fact that you had the courage to go for it with the new machine. My favorites are the FSL and the kitty. I hope to someday afford an embroidery machine of my own. Good luck with your new machine. Congratulations on your new machine!! I KNOW you'll love it. I have it's little sister the Ellisimo Gold 2, a Pfaff Creative Icon and a Bernina 830, all sewing and embroidery machines. Love machine embroidery and digitizing! Thanks for sharing the fun you've been having with your new machine! They are amazing! I like your pouch. 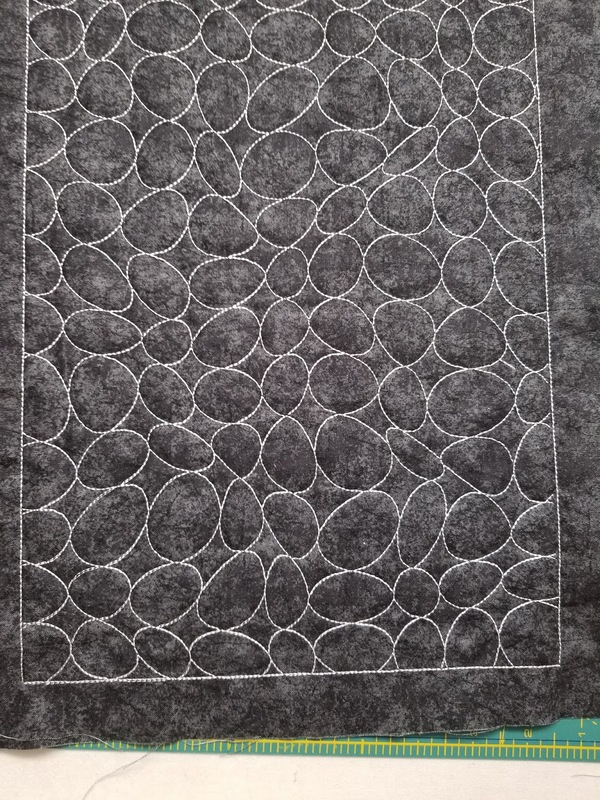 I recently started to learn free motion quilting, and this could be a thing to practice on. Thanks for the idea. Those FSLs are pretty. Hope I'm lucky to win them. Look at you having so much fun, being so creative and making such awesomeness!!!! I would never have guessed you just got your embroidery machine...wow!!! 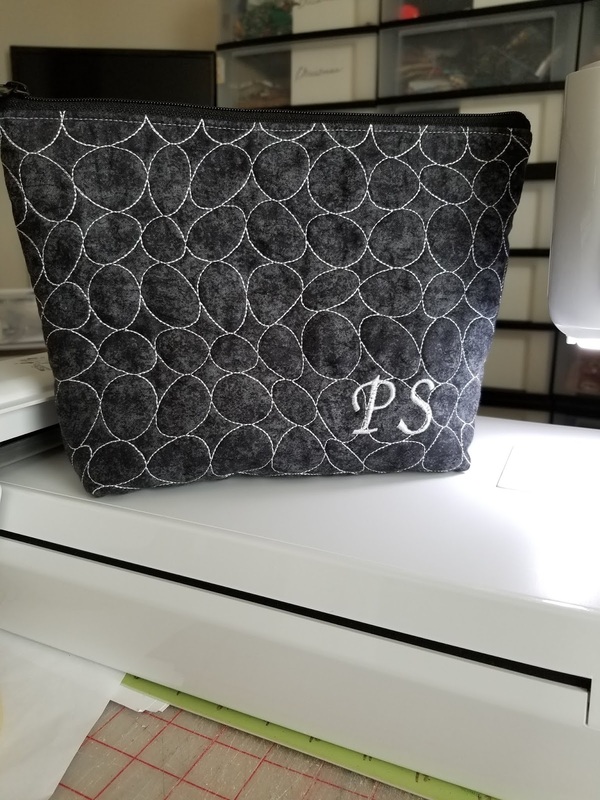 Your pouch is great and the frame of your sister's name...she will love them! Your cat really made me smile...I want to make some too!! The FSL is amazing and I think they look very professional! 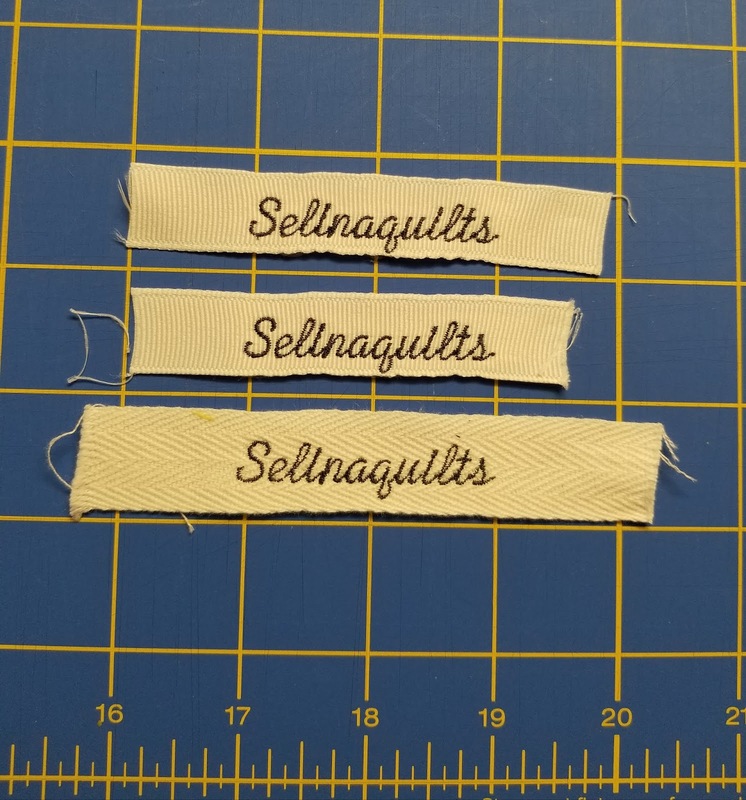 By being able to embroider on ribbon, you can create your own tags for your creations! Congrats on your new purchase! You are off to a wonderful start. I am a cat lover, so I adore your t-shirt, with or without a body. I just had to laugh at those pictures - they were expected. Thanks for the laugh. I love the lace and am very impressed with all that you have accomplished. Thanks for joining the hop and sharing all your lovelies with all of us. Oh wow...you have made many strides from unboxing your new Baby!!! What great results, shhhhhhh don't tell anyone you're a newbie - you just can't tell! You got me big time with the cat, that is awesome! Congratulations on your new embroidery machine! I would love to get one myself, but I am not sure I could get the hang of it. Have fun creating! I don't do embroidery, so I don't have any advice. I can only say that I think your cat shirt is amazing! That is a really nice machine. I have a very old babylock machine with an embroidery function that I have to use embroidery cards in but I was able to buy used ones at reasonable prices so have enough for my needs. One of my favorite things I do with my machine for quick gifts is to embroider kitchen towels. I usually do something that relates to the recipient or if it is for a holiday something relating to that. Your new machine will give you even more possibilities and it will be fun to see what you do with it. Wow, the projects look great, and it appears I may be putting a new machine on my wish list this year. 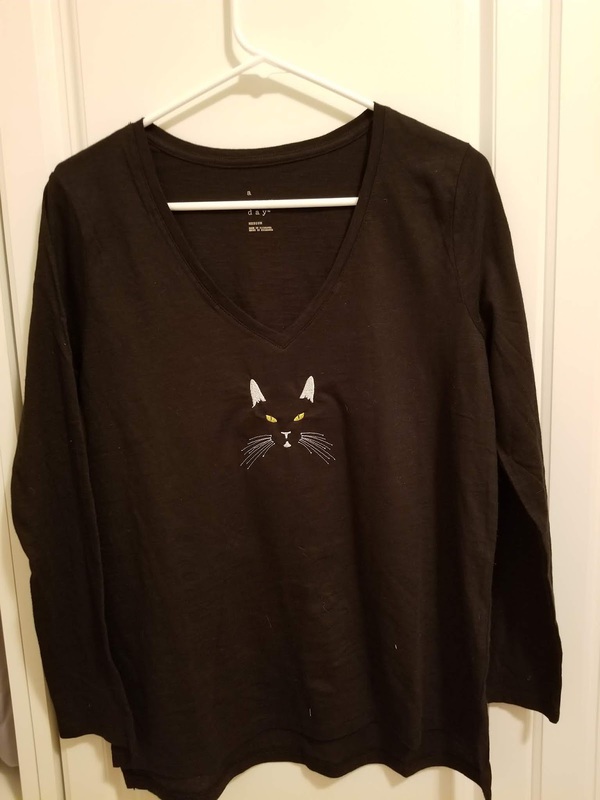 The cat shirt is just the best! Your post is very interesting. I am one who has never wanted an embroidery machine, but I have 2 friends who have purchased a Solaris and love it. It is neat to follow along with your learning experiences. Not sure I want one yet, but my interest is slightly peaked. I especially love the kitty shirt you did. Thanks for sharing. What fun you are having with your new toy! I love those little ornaments - never heard the term free-standing lace. Looks like you are going to have years of creativity ahead. No thanks on the giveaway. 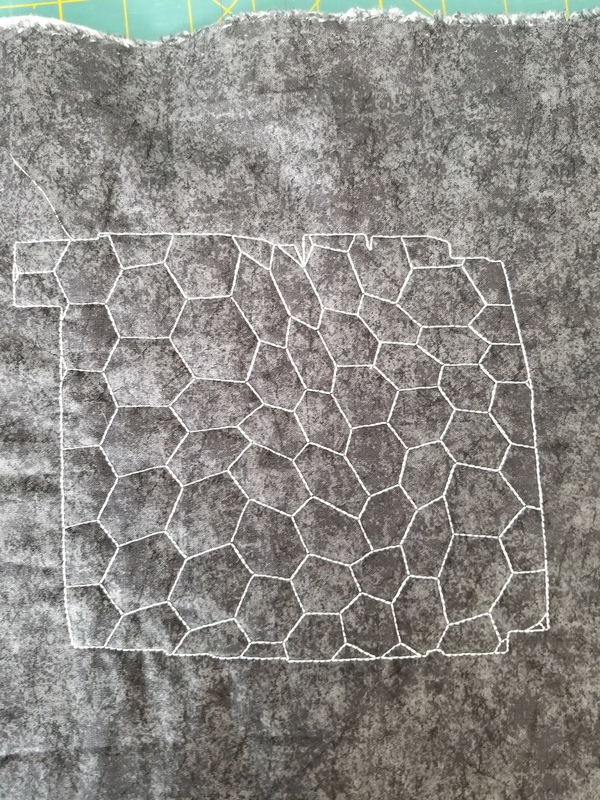 I had no idea embroidery machines can do edge to edge quilting. mind blown. very nice work. Well I see you will have lots of fun with your new machine , you are off to a great start for sure . The zippered pouch is great and the little lace ornaments are adorable . Beautiful and fun projects! What a great job playing and learning! Congratulations on the new machine Selina. Doing embroidery by machine offers so many more possibilities to your quilting experiences and even for sewing. I know for me it has changed the way I sew and quilt. Should you have any questions, feel free to email me, I'll help the best way I can. Something I'd encourage you to do is find some editing software, such as Embrilliance, Embird, or Sew Art Pro so you can learn to change designs out, convert designs, or even edit them. There is a lot of really great help on all of the above softwares and perhaps you'll even get into creating your own designs at some point. If your machine didn't come with digitizing software, explore the possibilities with the various softwares before you decide to purchase software. Every software is different and learning them is a huge learning curve so you want something you understand well. The other is working with letting, your already doing that, but when you have editing software you can add lettering to designs you've purchased or downloaded freely to make it even more fun. There are free design groups on Facebook you can join also to experiment with designs before you try buying from a digitizer. I'm very excited for you. Machine Embroidery is a fun and wonderful way to add to our sewing skills. Great Job on your projects today. What fun to have a new machine to play with! Love your projects. Keep having fun with it! Great projects, the cat face embroidery on the blouse is just to sweet.